Elementary School Clip Art. Kid Clip Art. Supply Clip Art. Holiday Clip Art. The 12 colors included are: red, orange, yellow, green, light blue, royal blue, purple, brown, black, gray, pink and white. All images download in a zipped file. There is a separate folder for black & white and color images. 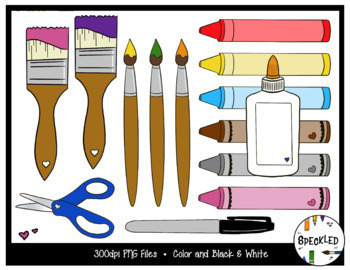 The Speckled Sink provides 300dpi quality clip art PNG files for personal and educational use only. The digital files are not to be resold, distributed or traded. They are for the use of an individual owner unless multiple licenses are purchased. - Design products you sell on Teachers Pay Teachers as long as the images are locked in the PDF file. - Design products you offer as “Freebies” on TpT. This requires credit via badge and/or store link. - Use the images in your classroom, home office and/or professional coursework. - Resell the images as a clip art set (even if you have hand colored the black and white images). - Resell the images as part of a compilation of clip art via hard copy or digital downloads, paid memberships. - Resell products (rubber stamps, mugs, t-shirts, cutting files, paper piecings, scrapbooking or piece and cuts). - Offer “Freebies” created with my designs on sites other than Teachers Pay Teachers. All products are ©2019 – The Speckled Sink. Always create something NEW with these files; NEVER share or sell files "as is" with anyone else. If you have questions about the fair use of this product, please contact The Speckled Sink prior to purchase. I love to hear feedback from users about the creative things they have done with my images. Please comment and share! Contact me directly with any file questions or concerns; I want you to be happy with your purchase! !